Modern crystallography is a multidisciplinary science involving fields as varied as biology, chemistry, geology, mathematics, materials science, medicine, mineralogy and physics. It permeates our daily lives and it is one of the fundamental pillars upon which modern academic institutions and industries rely to develop and characterize novel materials. In spite of this, crystallography has not fully steeped public awareness. Only rarely it is taught in high school, and only a few universities offer a cycle of lectures on the topic. In such a context, we should not be surprised by the fact that the wider public associate the term "crystal" almost exclusively with gemstones and minerals, or even amorphous materials possessing a high refractive index! 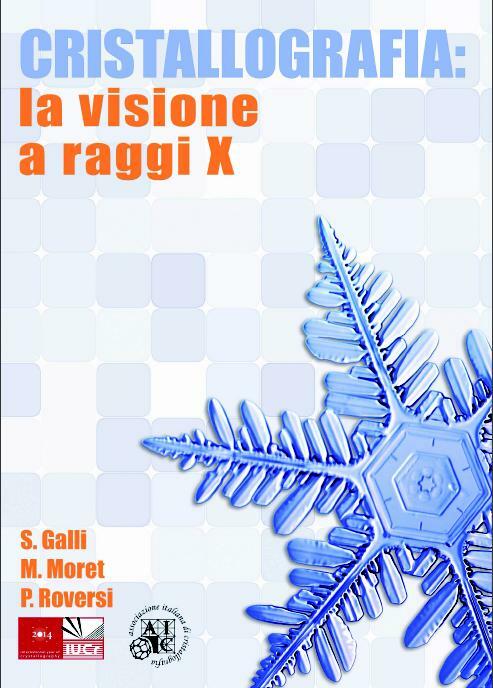 In this context, the book “Cristallografia: la visione a raggi X” (244 pages), written as part of the celebrations of the 2014 International Year of Crystallography by Simona Galli (University of Insubria), Massimo Moret (University of Milano Bicocca) and Pietro Roversi (University of Oxford) under the patronage and sponsorship of the Italian Crystallography Association, aims to disclose the fascinating world of crystallography to the general public. More in detail, the book specifically addresses high school teachers and students, in the hope of introducing them to several aspects of crystallography, with the ultimate aim of seeding in them interest and passion for this discipline. The title of the book recalls the extraordinary powers of superheroes. Step by step, the readers will learn that modern crystallography is nothing of the kind. Besides clarifying what is rigorously meant with the term crystal, the book comprises a short history of crystals, starting from the ancient Egyptians, going through the first studies of crystals in the XVII century, and reaching X-ray crystallography, born in 1912 and growing to this date. Two more chapters help the readers understand what a crystal is and how, when X-rays interact with it, it is possible to “see” the distribution of atoms inside. To highlight the all-encompassing character of modern crystallography, examples of its applications in industry are illustrated and discussed. The tools of the crystallographic trade are then displayed in an attempt to give a sense of the crystallographer’s working habits and skills. Last but not least, the readers discover the mechanisms governing the growth of crystals and, thanks to ad hoc recipes, they have the opportunity to try and grow their own crystals of common substances, such as table salt and sugar. Written in Italian, and distributed in 800 free copies in high schools nationwide in Italy, the book is presently being translated into English and Spanish: the authors hope to find National or Regional Crystallography Associations willing to sponsor the distribution of the English and Spanish editions among teachers and students, for the book to continue abroad and worldwide the voyage started in Italy. Chapter 7. Come crescono i cristalli?